How the dusty Merriam-Webster dictionary reinvented itself. Bigly. 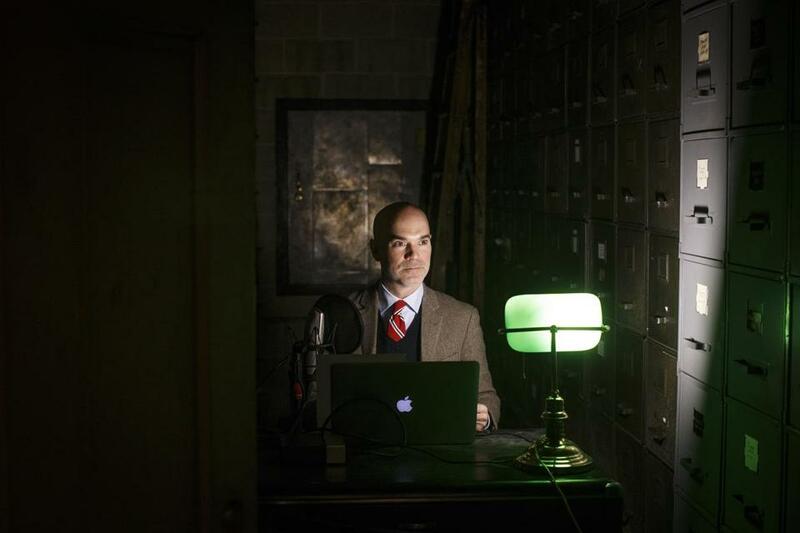 Editor at large Peter Sokolowski records podcasts in the basement of Merriam-Webster’s Springfield headquarters. THIS IS WHERE YOU find the words. All of the words. The common words we use every day. Rarer words that suddenly reappear in the collective consciousness, like “jingoism” or “dossier” or “bigly,” and some that haven’t been pulled down from the shelves in decades. (“Snollygoster”: a shrewd, unprincipled person, especially a politician.) They’re all here, all archived and accounted for. The words have a warehouse. It’s a drab, hulking, two-story brick building in the lonely heart of Springfield that dates to the Depression years. From the sidewalk, it looks like an old elementary school. But on a wintry Tuesday afternoon, the cavernous rooms inside are nearly empty. There are clusters of understaffed cubicles, a few empty offices, quiet conference rooms. The vast majority of the space is occupied by inert materials — files, card indexes, countless linear feet of leather — and clothbound books. You could really lose yourself in the stacks in the half-lit basement. You might call this the morgue, but then you’d look it up to be sure, and Merriam-Webster’s online dictionary would confirm what you suspected: that the secondary definition of “morgue” does indeed refer to “a collection of reference works,” but only in the context of a newsroom. This is not that. This quiet building where they store the words is home to the historic Merriam-Webster family of dictionaries, from the first, published in 1828, to the 11th edition of Merriam-Webster’s Collegiate Dictionary, which came out in 2003. It’s an archaic system, all this research in all these cabinets, most of it pecked out on old manual typewriters and annotated in pencil. Covfefe: What is it? Why did Trump tweet about it? The president’s early morning tweet entertained the Internet for hours. The dusty dictionary is back. Bigly. IF THERE’S ONE THING the Merriam-Webster office doesn’t seem prepared to produce, it’s innovation. But the company’s remarkable reconfiguration for the digital world is a logical extension of the Merriam brothers’ commitment to democratizing the language, says editor at large Peter Sokolowski, who works in the building with some 40 colleagues. He’s become the public face of Merriam-Webster in the Information Age, appearing in explanatory videos, recording the company’s popular Word of the Day podcasts, and representing the dictionary at the Scripps National Spelling Bee. The “Webster” in Merriam-Webster was Noah Webster, the New Englander who founded New York City’s first daily newspaper and created the ubiquitous 19th-century textbook known as the Blue-Backed Speller. In 1806, Webster published A Compendious Dictionary of the English Language, in which he established many of the Americanized spellings of English words we now take for granted — “color” without the u, “center” instead of “centre.” He toiled for the next two decades on his comprehensive American Dictionary of the English Language, publishing it in 1828 at the age of 70. He sold the two-volume set for $20 a copy. That was a whopping sum, Sokolowski says — enough to buy a grandfather clock. Webster died in 1843. Four years later, Springfield’s Merriam brothers (there were three, though only George and Charles had their initials on the family printing business, G. & C. Merriam) issued the first of the company’s many major revisions: a $6 “New and Revised” American dictionary, followed by a $3 abridged Collegiate Dictionary, and a 35-cent pocket version that became a bestseller. More print editions followed. That’s how the business worked for more than a century. And then the Internet came along. Online, its chief competition is Dictionary.com, which is based on Random House’s Unabridged Dictionary. Google a word, and you’re likely to see those two vying near the top of the search results. (Others in the mix include Oxford, Macmillan, and the Free Dictionary.) But Merriam-Webster has clearly learned how to boost its brand recognition through the use of social media. Its Twitter account, run out of the company’s New York office by social media manager Lauren Naturale (a native of Medfield) and colleagues, with input from Springfield headquarters, has been duly noted as an astute, quirky, and humanizing exemplar of corporate communications. When Donald Trump memorably misspelled “unprecedented” in a December tweet, the dictionary joked that its Word of the Day would not be “ ‘unpresidented’. . . . That’s a new one.” When Trump warned about “bad hombres” from Mexico, @MerriamWebster tweeted: “We’re seeing a spike for both ‘ombre’ and ‘hombre.’ Not the same thing.” Such up-to-the-minute commentaries have earned the company a booming Twitter following of more than 300,000 — nearly two-thirds of them signing on in the past year. Turns out it’s a banner time for logophiles. In October, the former chief editor of the Oxford English Dictionary, John Simpson, published his own memoir, The Word Detective. Meanwhile, Mel Gibson and Sean Penn are in production on a feature film of The Professor and the Madman, Simon Winchester’s best-selling account of the making of the original OED and the institutionalized correspondent who contributed 10,000 entries. 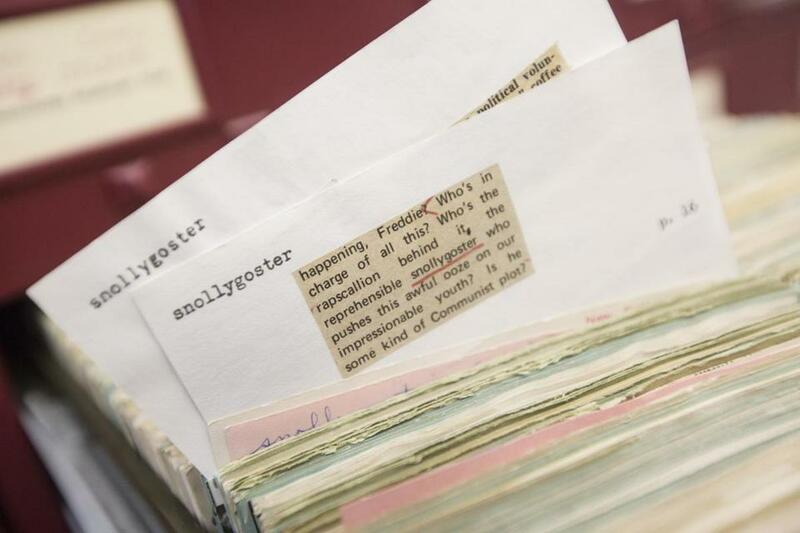 Examples of how words are cataloged on index cards at the Merriam-Webster offices. DICTIONARIES MAY BE basking in the glow of attention, but the work that goes into them seems likely to remain grubby and unglamorous. With most of his co-workers headed home, Peter Sokolowski prepares for his last task, printing his script for tomorrow’s Word of the Day podcast, then trotting down the staircase to the bowels of the building. He has discovered a noiseless hideaway in which to record the daily two-minute segment: a long, dark, narrow back room behind a storage vault in the basement, lined on either side with floor-to-ceiling file cabinets. To the average ear, Sokolowski has no discernible accent. He grew up in the Merrimack Valley, in the northeast corner of Massachusetts. “My father has never said an ‘r’ in his life,” he says with a laugh. Occasionally, an online viewer or podcast listener will detect a faint hint of the North Shore. Showing the work of the dictionary and its makers, through podcasts and social media, lends personality to a document that’s commonly viewed as impersonal. In fact, Sokolowski says, dictionaries can’t help but take on the personalities of their creators. Samuel Johnson, who published A Dictionary of the English Language in 1755, was “overwhelming.” Webster’s born-again beliefs, which informed the homilies he appended to his entries for words such as “father,” “love,” and “sin,” have made reprints of his 1828 dictionary a consistent favorite of Christian home-schooling families. Both Sokolowski and Kory Stamper delight in claiming their obsession with words makes them “boring.” To their devotees, they’re anything but. It was the late Merriam-Webster editor Philip Gove who laid the guidelines for the rigidly stylized definitions Sokolowski jokingly refers to as “dictionary-ese.” Gove — editor in chief of Webster’s Third New International Dictionary, first published in 1961 — insisted on a formula designed to explain a word to someone utterly unfamiliar with it. That approach resulted in some unfortunate entries, such as this one for “hotel”: “a building of many rooms chiefly for overnight accommodation of transients and several floors served by elevators, usually with a large open street-level lobby containing easy chairs, with a variety of compartments for eating, drinking, dancing, exhibitions, and group meetings (as of salesmen or convention attendants). . . . ” And so on. Such phraseology has been rightfully ridiculed, says Sokolowski. Webster’s Third was also criticized for its “permissive” inclusion of curse words and bad grammar: David Skinner’s 2012 book on the literary hubbub it created is called The Story of Ain’t. But for all of Gove’s detractors, to Sokolowski, his guidance was admirable. “Tell the truth about words” Gove liked to say. Words belong to everyone. That was Noah Webster’s premise, and now, in a world Webster couldn’t have imagined, his successors are delivering that message in newly definitive ways. As the rest of us debate the existence of “alternative facts,” they’re keeping it simple: They’re telling the truth about words. James Sullivan is a frequent contributor to the Globe. Send comments to magazine@globe.com.